1. In a small bowl prepare marinade. Whisk together pineapple juice, teriyaki sauce, honey, rice vinegar and ground ginger. 2. Place pork chops in a large glass container and cover with marinade. Seal container and place pork chops in fridge for 3-4 hours or overnight. If possible, turn bag every hour or so to evenly cover pork chops with marinade. 3. Remove pork chops from bag. DO NOT DISCARD MARINADE. 4. In a small sauce pan over medium heat, bring marinade to a boil. Reduce heat to low and simmer sauce for 15-17 minutes until sauce thickens, making sure to stir sauce frequently. After sauce has thickened, remove from heat and place in a small dish. You will use this marinade sauce while grilling pork chops and pineapple. 5. Preheat grill to medium-high heat. Lightly coat grill rack with nonstick cooking spray. 6. Place pork chops on grill and brush often with marinade sauce while cooking. Cook pork chops on each side for 4-5 minutes or until cooked through. 7. Delicately add pineapple slices to grill and cook for 1-2 minutes on both sides. 8. Let pork chops rest for 2-4 minutes before serving. 9. 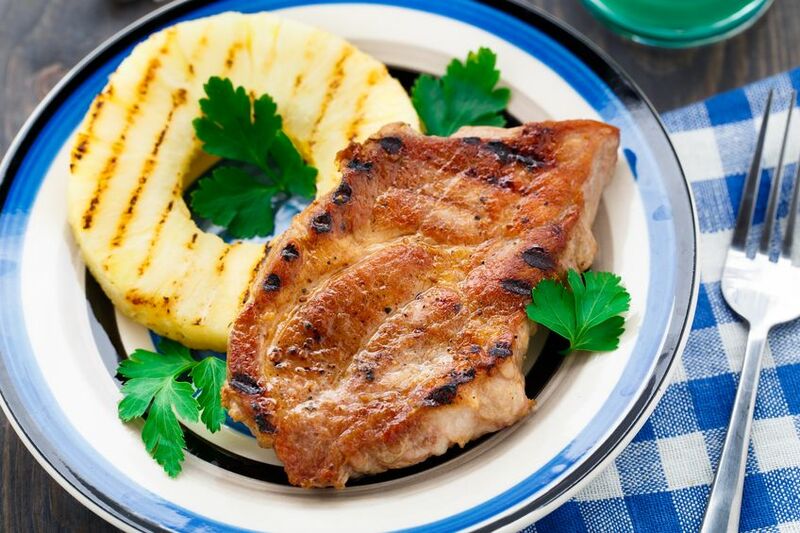 To serve, place a grilled pineapple slice on top of each pork chop and sprinkle with chives. 2. Combine the lemon juice, honey, and salt. Cut the pears in half lengthwise and remove the stem down to the core. Combine the pears with the lemon mixture. 3. Line a baking sheet with aluminum foil. Place a rack on top of the foil in the baking sheet, and place the pears, cut side up, on the rack, reserving the lemon juice mixture. Drizzle or brush each pear with a little of the lemon mixture. 4. Roast until the pears are completely tender and slightly caramelized on top, about 40. Remove the pears from the oven and allow to cool to room temperature. Once cool, cut each pear into 3 slices. 5. To make the vinaigrette: Whisk the vinegar, olive oil, honey, salt, and pepper. 6. 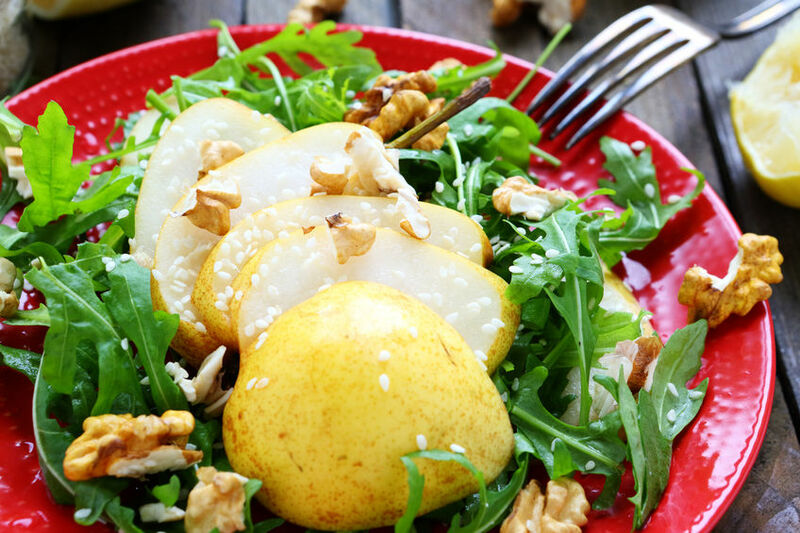 Combine the pear slices, arugula, vinaigrette, walnuts, and blue cheese in a large bowl and toss. 1. Preheat oven to 375 degrees F. Place tomatoes and onion in a baking dish, and drizzle with 1 Tbsp. olive oil and season with salt and pepper. Place head of garlic on baking rack. Cook until onions and tomatoes are caramelized, about 45 minutes. 2. 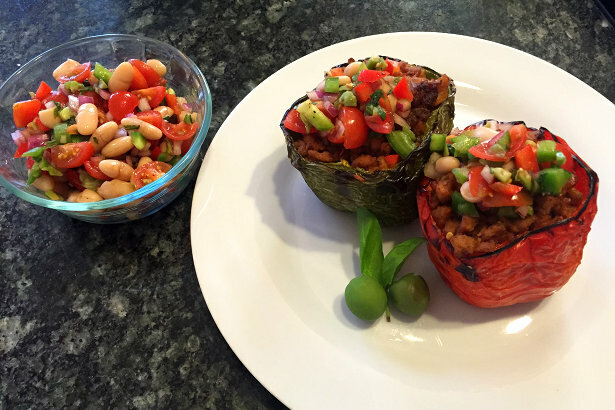 Remove vegetables from oven and allow to cool. Preheat broiler. In the meantime, slice sourdough into 1” thick slices. Combine ¼ cup of olive oil with minced garlic, fennel, oregano, and crushed red pepper flakes. Brush each slice of bread with olive oil mixture. Place sliced bread under broiler and brown on each side, watching closely. 3. Remove bread and place aside. Dice roasted onion once cooled. Combine with tomatoes. Remove skin from garlic and cut off one end of head. Squeeze roasted garlic out into the tomato mixture. Add basil, balsamic vinegar, remaining tablespoon of olive oil and season with salt and pepper. 4. 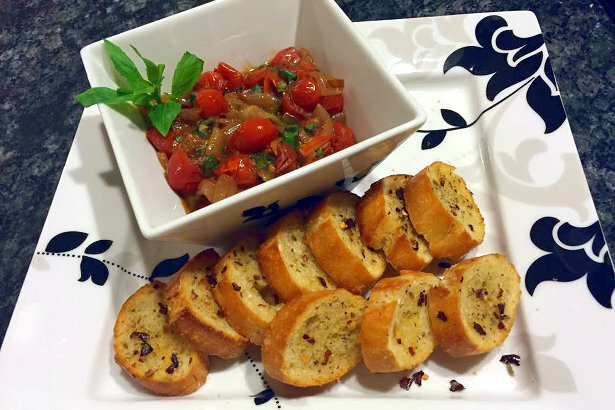 Top toasted bread with tomato mixture and enjoy! 1. Sauté onions and garlic with 1 tsp. olive oil or cooking spray in a nonstick pan. Add ground turkey and sausage until onions and translucent and turkey is no longer pink. Add spices. 2. Combine salsa ingredients and let sit in refrigerator at least 30 minutes (overnight is recommended). 3. Broil peppers on each side for 1-2 minutes. Add turkey mixture to peppers and bake at 350 degrees for 15-20 minutes or until peppers are slightly softened. 4. Top each pepper with a spoonful of salsa and enjoy! 2. Slice chicken breasts down the middle to create a pocket and squeeze with juice from the lemons. Season with salt and pepper. 3. Use a food processor or spice grinder to blend pine nuts into a course powder. 4. 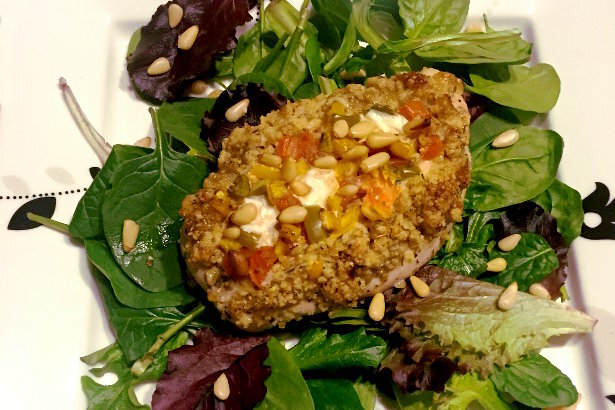 Coat each chicken breast with egg whites followed by pine nuts and arrange in baking dish coated with non-stick cooking spray. 5. Combine tomatoes, diced bell peppers, salt, pepper, garlic, and balsamic vinegar. 6. Stuff each chicken breast with the tomato and pepper mixture, followed by 4 pearls (or 1 ounce) of mozzarella. Sprinkle with oregano. 7. Bake for 30 minutes or until golden brown. Serve atop a bed of baby greens. 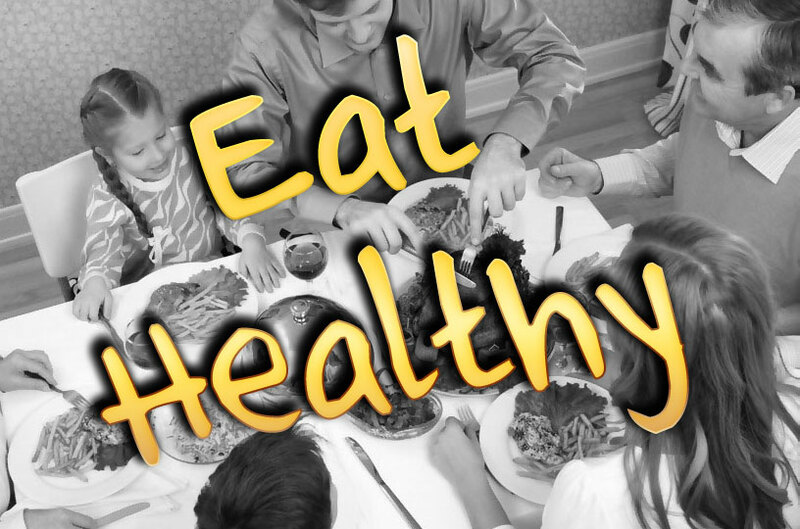 Nutritional information for one chicken breast: 328 calories, 31 grams of protein, 20 grams of fat, and 2 grams of fiber. 1. Use spiral slicer to cut daikon into thin, noodle-like strands. 2. Cook daikon in a dry, non-stick skillet on medium-high heat for 5-10 minutes, stirring frequently, to reduce moisture content. 3. Remove daikon from skillet and set aside. Coat skillet with olive oil and add minced garlic. Cook over medium-high heat for 1 minutes, then add shrimp. Cook 2 minutes, then add lemon juice and wine. Cook until shrimp begin to turn opaque and curl. Add goat cheese, feta, crushed red pepper and basil. 4. 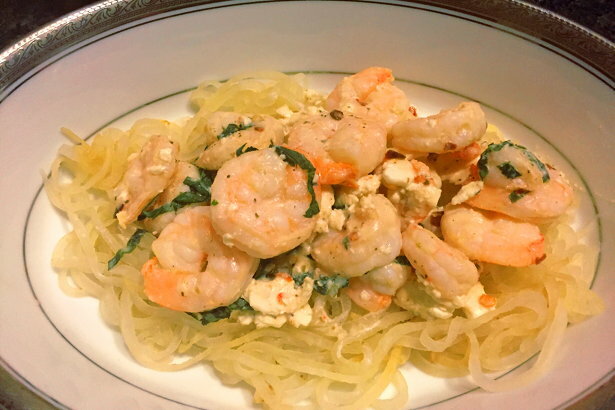 Plate daikon “noodles” and top with shrimp. Enjoy!